Last week's Community Life guest, wordplay wizard Richard Lederer, left students and faculty laughing, groaning, and scratching their heads over his mastery of language. Lederer is a speaker, teacher, and author of more than 30 books about grammar, oxymorons, anagrams, and more. He read several pun-filled excerpts from his latest book, Monsters Unchained, then shared his personal journey from an unhappy pre-med student to a joyful and fulfilled "verbivore." 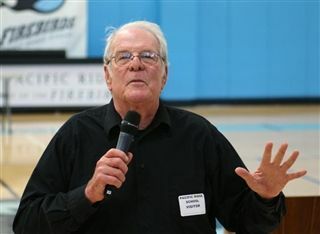 Following his presentation, Lederer stopped by several English classes, where he joined discussions about poetry and fiction, and answered students' questions about his life and career.